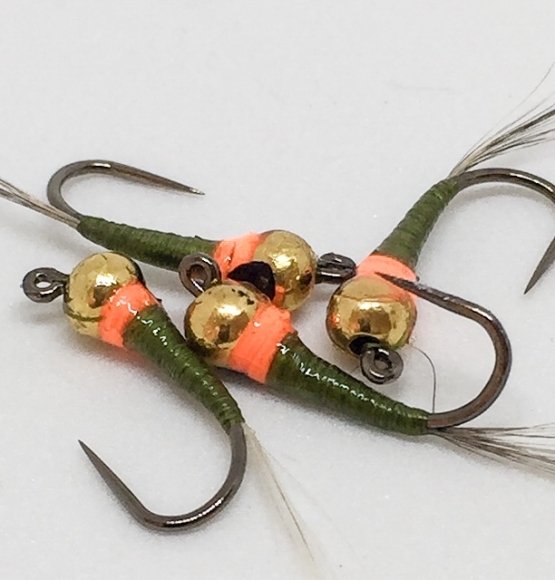 Jigs flies, with a compact lead ball on the hook, began to be used approximately 25 years ago on the Traun River in Austria, where local fishing rules allowed the use of only one fly. In May 1988, Mr. Karel Holub brought some weighted jig nymphs to the Czech Republic for world champion Slavoj Svoboda, who used them with great success in the National Selection competition on the Vltava River in Vyssi Brod. Subsequently, Mr. Klima started to produce jigs flies for Rudi Heger, and in 1990 Mr. Jan Siman started to sell lead-weighted jig nymphs in the Czech Republic. At that time, VMC jig hooks with a 90 degree bend were available in the Czech market. Soon after our success with these jig-nymphs in the World Championships, they weroe banned in FIPS-Mou events. Several years later in 2001, a change in FIPS-Mou rules allowed the use of one bead with a maximum diameter of 4 mm, and Czechs continued to fish with jigs. Right before the 2004 World Championship in Slovakia, a new explanation of the rules stated that a bead is permitted but without permanent fixture to the hook. The Czech team was in a critical situation because they had practiced the entire week before the Championship with classic jig nymphs. Team members Jaromir Sram and Daniel Scvrcek along with team captain Jiri Klima decided to remove the lead ball from Knapek jig hooks, and replace it with a tungsten bead. They then called Mr. Jindrich Knapek and asked him if he had any hooks available without lead. Mr. Svrcek’s girlfriend brought some of these semi-complete gold coloured jigs, with a 45 degree angle in sizes 14 and 16, to the competition. Combined with the tungsten bead, these new jigs were very successful, and this trick is still widely used. Mr. Knapek started to produce this new design in summer 2004, followed by Mr. Skalka in 2005 Mr. Hanak in 2006, and the Czech Fasso company in 2008. Currently these jig hooks with a 45 degree angle are often used for short nymphing as the point fly, and in the Czech modification of French nymphing with a very long leader of 6 – 9 m that can be tapered or linear. A strike indicator should be included in this long leader to better identify fish takes. These new jigs are different than classic gold heads because the hook point is turned toward the bottom during drifting. Magic Quills, Now You Create The Most Amazing Flies. A sleek little mayfly imitation with some glitz to set it apart from the crowd. Jig Flies bounce the bottom without snagging up as frequently. Another must have for the box, they cant refuse red tags !!! !